元気？= Genki = How are you doing? We now have two cat teachers working on a lesson and I have been helping them. It is great that dogs and cats are working together. Meanwhile, I will repost a mini lesson from Facebook, Maggie Sensei. I just tweeted the word recently. = How’s it going? / How are you doing? = Shigoto no choushi wa dou? = How’s work? / How’s business (going)? If the person has a problem — like an injury– with their foot. = Ashi no choushi wa dou? Note : We often skip the particle は ( = wa) in conversation. = Shigoto no choushi dou? = Ashi no choushi dou? = (~ no) choushi wa dou desu ka? = (~ no) Choushi wa ikaga desu ka? 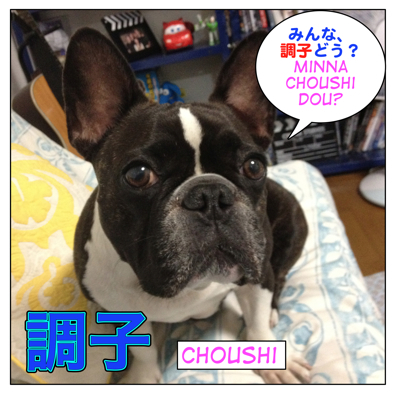 You can use 調子 ( = choushi) for your health, business, assignments, studies, machines, etc. = Kuruma no choushi ga okashii. = There is something wrong with the car. = Onaka no choushi ga warui. = I have an upset stomach. = Don’t get carried away! = Maggie sensei, choushi wa dou? = How ‘s everything, Maggie Sensei? = Mata mein no sensei to shite koko ni korarete ureshikatta desu. = I was very happy to be back here as a main teacher. Special Note: This lesson is translated in Spanish by Laura. I posted on my Facebook page. If you speak Spanish, go check the translation. Thank you for the new lesson, Maggie!